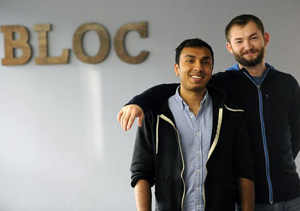 Dave Paola and Roshan Choxi, two 2010 U of I alumni, started Bloc, a revolutionary way to teach coding and web development. Two young men who met at the University of Illinois at Urbana – Champaign started a company called Bloc, which is an online apprenticeship which teaches coding and web development. Dave Paola and Roshan Choxi launched Bloc in 2012, but recently announced a crucial investment led by Harrison Metal. Read more of their story and an interviewat SFGate.